We are among the leading industries engaged in offering an exclusive range of Sodium Starch Glycolate to our clients in varied sizes. Offered products are manufactured using high-grade quality raw chemicals, in accordance with the industrial norms and guidelines. Our range are appreciated widely for their insolubility in most of the organic compounds. We are a renowned organization engaged in manufacturing, supplying and exporting a broad array of Sodium Starch Glycolate. 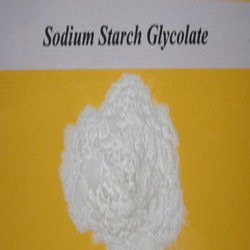 Sodium Starch Glycollate (SSG) works by rapidly absorbing water. When medicines are contained within tablets or granules, they are coated with SSG. It is a sodium salt of carboxyl ether of starch, and is appreciated for its stability and binding properties.